Growing Strawberries - How To Grow Your Own Strawberries! Growing strawberries is great way to add lasting flavor to your landscape. Spring is coming, and that means strawberry season is just around the corner! Nothing can beat the taste of fresh strawberries, homemade strawberry pie, or delicious strawberry jam. Or for that matter, anything strawberry! And you might be surprised at just how easy a small strawberry patch is to plant, grow and maintain. Contrary to what many think, strawberries are actually a low-maintenance crop. As a perennial crop, they continue to produce year after year, providing fresh berries for all of your favorite strawberry treats. Strawberries can be divided into two main categories. June bearing strawberries tend to be larger and meatier. June bearing, (often called spring-bearing), produce one large crop early in the growing season. Everbearing, on the other hand, produce all throughout the season, but with few berries at one time. June bearing strawberries bear their entire crop over approximately a three-week period. This occurs in most growing zones in June – hence the name. June bearing strawberries tend to be larger and more plump. These are the strawberries you most often see in the grocery aisles or at farmers markets. On the other hand, everbearing plants produce a smaller-sized berry. Everbearing produce all season, but are usually a bit smaller. But they do so continuously. From early June until the first frost. Everbearing varieties are an excellent choice for patio planters and small spaces. They are also perfect for those looking to have a supply of fresh berries on hand all summer long. Each variety has a bit of different requirements to grow. We will take a look at both, starting with June bearing strawberries. One of the best things about growing strawberries? Making delicious treats like strawberry jam! In climates that have more of a true winter, plant strawberries in the early spring. A good rule of thumb is about 2 to 3 weeks before the last frost. For warmer climates, you can plant in the early spring as well, However, it is even better to plant in late fall in these regions. It sets the stage for bigger crop the first spring. June bearing strawberries need to be planted on slightly raised ground from the surrounding soil. Begin by working in generous amounts of compost to the soil before planting. It is a good idea to cover the area with plastic or landscape fabric before planting. This aids greatly in keeping competing weeds from taking over bed space. Having plastic or landscape fabric under the plants helps keep weeds out. If planting in rows, set plants 10 to 12″ apart in the rows. You can plant in single rows about 12” wide – or double rows that are 24” wide. For easy picking, allow at least 24” between rows. Next, cut out holes for plants through the barrier with a sharp knife. This allows easy access to plant and water. Set plants so that the upper portion of the crown is slightly above the level of the ground. A strawberry plant start created from an offshoot of an older plant. The crown is the portion of the plant directly above the root area and below the first set of leaves. Water the roots well before covering with soil. As you plant, press in the soil gently around the roots. This prevents the plants from heaving out of the soil. In late fall, mow, or use a string trimmer to trim back plants. Trim back to an inch or two above ground level. Fall is a great time to mulch around plants with compost too. The compost breaks down and adds nutrients to the soil. Rows should have at least 24″ left between plantings to allow for picking. This helps feed it for the following year’s crop. Next, apply a few inches of straw or pine mulch over the top of plants. This will help protect them through the cooler winter months. Growing Strawberries – How Long Will My June Bearing Plants Last? Although a perennial, strawberry plants do decline in production as they age. But there is no need to purchase new plants. After 4 or 5 years, you can replace the older plants with the new growth of offshoots. This can be done in mid-summer, after the plants have finished fruiting. It gives the plants enough time to become re-established before fall. This helps to keep strawberry plants and beds at their productive peak. For containers strawberries, the emphasis is on keeping the soil in the container productive. 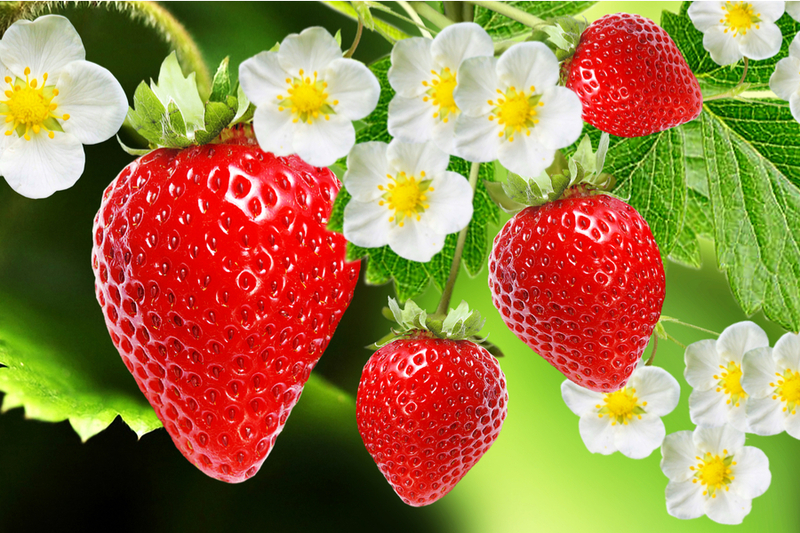 Everbearing strawberries are a great selection for growing in containers and pots. Be sure to provide plants with plenty of loose, fertile soil to provide adequate nutrients. Pots should be at least 6″ deep for good root growth. A light application of fertilizer every month during the growing season will help plants to keep producing. compost and worm casting work great for this. Potted plants can be brought inside in the winter months for protection. A dark, cool basement or garage will usually work perfectly. Much like with June bearing, pots should be replanted with newer offshoots every 3 to 5 years.